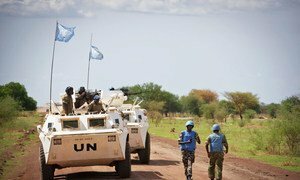 UN peacekeepers on patrol in Abyei. United Nations Secretary-General Ban Ki-moon today announced the appointment of Major General Hassen Ebrahim Mussa of Ethiopia as Force Commander of the UN Interim Security Force for Abyei (UNISFA). Major General Mussa has a long and distinguished career with the Ethiopian Armed Forces, and is currently serving as the Head of Peacekeeping Coordination Center in the Ethiopian Armed Forces. He graduated from the Ethiopian Defence Command and Staff College in 2005 and was a Corps Commander in the Ethiopian Armed Forces from 2011 to 2012. He previously served as the Sector Commander North in the African Union-UN Mission in Darfur (UNAMID), where he gained valuable experience in UN peacekeeping. Prior to this, he held a number of other appointments within the Ethiopian Armed Forces, starting in 1995. The United Nations Security Council today extended for another five months its interim peacekeeping force in Abyei, a resource-rich area contested by Sudan and South Sudan, calling on both sides to swiftly resume regular meetings to resolve the oil-rich territory’s final status.